Whether you love or hate team orders, you have to empathize with the poor driver who gets one. Scuderia Toro Rosso’s Max Verstappen — perhaps following in Red Bull teams’ alumni Sebastian Vettel’s footsteps — decided that he wasn’t going to take it, and called out “NO!” over the radio. It’s at the time in the season when many teams are trying to maximize their points, so one way to do it is by giving your most promising finisher every chance he needs to succeed — including via team orders. A team is allowed to order one driver to hold back and let the teammate who the team would prefer to win on through. Many fans hate team orders. Personally, I don’t mind it, but I seem to be in the minority on this. Racing is more of a team sport than people give it credit for, so if the team needs to do what’s best for them as a whole, whatever. I’m with the haters on one point, though: team orders often nip many great intra-team battles in the bud. Individually — car versus car — it’s not racing. It’s letting your teammate past. The only thing worse than watching a team order go down is receiving one. There’s nothing more gutting than having your own team pronounce you as the slower, “number two” guy. I’d imagine sending a driver a team order is the easiest way to get a driver to doubt your faith in them. Let’s just say it’s a situation that needs to be handled delicately, if ever. 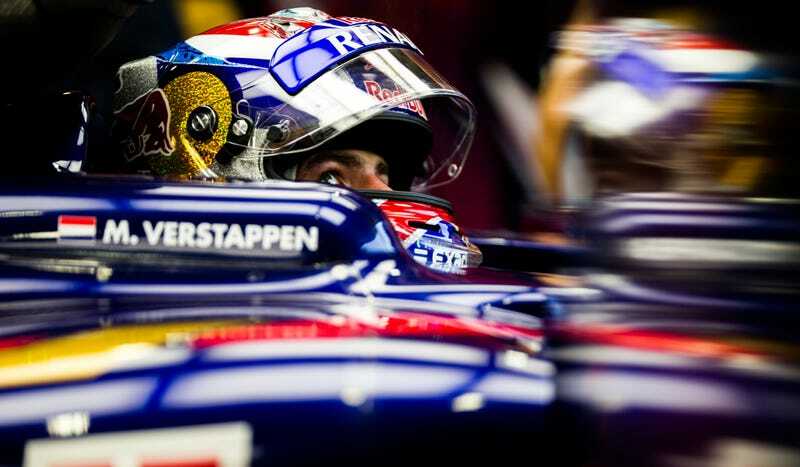 At today’s Formula One Singapore Grand Prix, Max Verstappen was ahead of teammate Carlos Sainz in eighth place, and Scuderia Toro Rosso felt it would be better to let Sainz chase down Sergio Perez in the closing laps of the race. “Okay, we need to swap positions,” radioed over the team. Verstappen then did what every person who’s ever been caught as the slow man on track would do if their inner “flat out” man-child had their way: he responded with “NO!” and kept going. “Max, just do it,” the team replied. Verstappen didn’t do it. There was no swap. Verstappen kept eighth place. Sainz got no help, and finished ninth. Haters of team orders, meet your new hero.